Tesco’s in the past were perhaps a little confused about Windows Phone. That is all set to change as they are now kindly offering the Nokia Lumia 710 and the Lumia 800 for use on their pay monthly tariffs. The Lumia 800 is being offered free of charge provided you are willing to commit to a two-year contract at £22.50 per month, available here. The Lumia 800 is not alone in its fight for the hearts and minds of the UK’s grocery buying punters, the 710 is here too. The Lumia 710 sports the same internals as the Lumia 800 but is a little more budget friendly due to its construction techniques. Tesco are offering that on a similar 24 month contract for £20.00 a month. 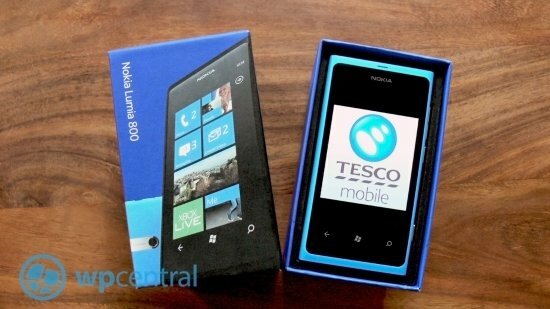 If you are someone that prefers to have his or her phone without the contract shackles, Tesco offer the Lumia 800 to purchase on Pay as you go for a hefty £359.97. I will note that you can buy the device cheaper on sites such as Expansys. Tesco mobile stocking Windows Phones is great news for the platform. Lumia handsets have proven to be popular with the phone buying public. From a recent article, it would seem that the Lumia brand has in fact overtaken Windows Phone in terms of brand awareness. An interesting theme is emerging in that retailers are not stocking HTC, Samsung or ZTE devices. I think this has to do with the scale of advertising the Lumia devices have received. Nokia have solid relations with retailers and they seem to be capable of leveraging that advantage to push Windows Phone to places it has not been before. I wonder if Microsoft’s other partners had been more active in pushing Windows Phone earlier, instead of their Android offerings would we have seen more traction today? Tesco as a company have a good relationship with Microsoft, so one has to wonder why it’s taken them so long to get to Windows Phone. After all, they have been offering a Tescos shopping app in the marketplace almost from the start. So, will any of you be popping in to your local Tesco’s to buy some milk and a Lumia in the near future? Do you think the recent Hollyoaks tie up is getting retailers excited about taking on Windows Phones? Why do you think Tesco are offering this now with Windows Phone 8 around the proverbial corner? I am always keen to hear your thoughts in the comments!